"The Premium" Natural Name Puzzle Stool. 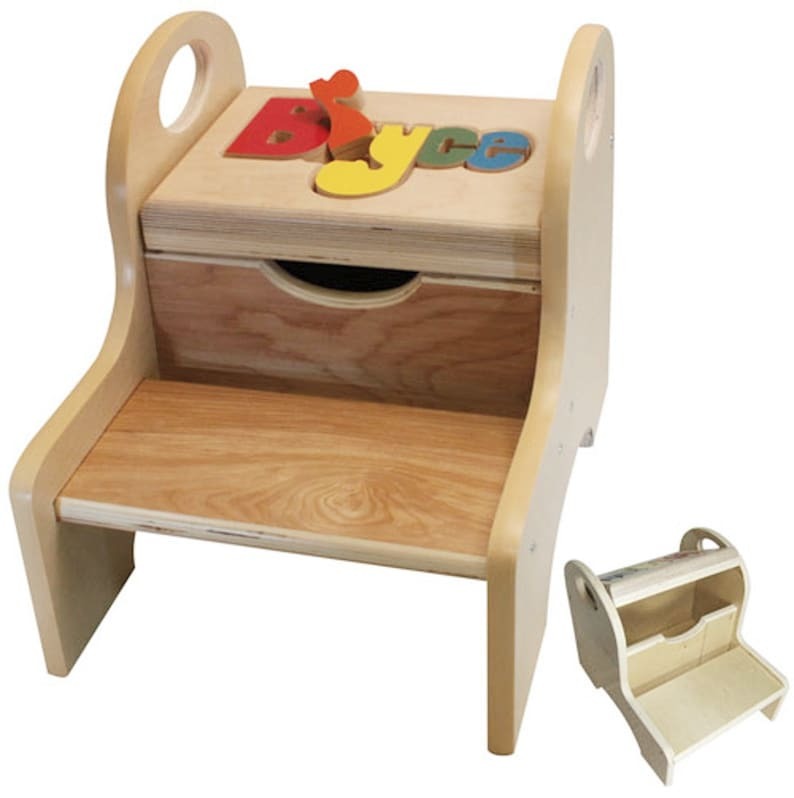 A 2-step stool with handles for easy carry and a storage box for their treasures. & non-toxic water base finishes. (The second photo shows my two standard letter color schemes). The Tops can be painted for an additional $10.00 but the step and sides cannot be painted. I can also engrave a message on the bottom of the stool that will last the life of the stool for an additional $15.00. Go to my Listing: https://www.etsy.com/listing/261264435/personalized-engraving-for-name-stools?ref=shop_home_active_15 to order an engraved message. If you live in the St Louis, MO Area save $10.00. Pick ups will recieve a $10.00 "REFUND" (Location: Hazelwood, MO 63042). Refunds will be awarded at the time the merchandise is received. Will ship to any US Military Base outside the USA. at no additional cost. Orders will be processed after all payments has been received. Personalized and Customized merchandise, once payment is received cancellations will not be honored. We provide as much information as possible for you to make a proper purchasing decision and we expect customers to ask all the questions necessary to determine the suitability of the merchandise they are buying. We will not accept returns because the merchandise did not meet your expectations. Request for refunds or replacements due to damage or lose must be made within 30 days of shipment to be honored. We will except returns and/refunds if the merchandise was damaged or did not meet our specifications. However,Grateful50 reserves the right to request photos of both the damaged purchase and the box it came in. before a final determination can be made. If a return is authorized neither a replacement nor a refund will be issued until the item you received has been returned. Or, the need for return has been waived by Gateful50. If the item is being returned due to damage or the wrong item was shipped Grateful50 will make the arrangement for the item to be picked up and pay for the item to be returned. All items are insured. Shipping damages should be reported to me with photos of the damaged item and damaged box. I will replace damaged items if they occurred during shipping. All shipments will be sent either Priority mail or FedEx Home Delivery or UPS whichever is less expensive. All shipments will be insured for damage that may occur through shipment to protect you. In case of damage I'll need Photos of both the damaged purchase and the box it came in. If you want the purchase shipped to an address other than your own, fill out the "Shipped To Section" of the checkout page accordingly. Otherwise we can not guarantee the shipment will arrive at the address you desire. If you have questions or asking for special or custom considerations, please call 314-825-5808.